Off Grid Solar Power Guide - Living off the grid with solar energy. Solar Off Grid Power for Remote Homes. Off Grid Solar Power. A solar system that provides off grid living... anywhere under the sun. Living off the grid offers security and freedom from ever rising energy costs. Off Grid Solar System. Go ahead - Live Anywhere! Off grid home solar power systems turn areas once considered uninhabitable into comfortably liveable spaces completely independent of the power grid. Not always the more costly choice, a remote off grid residential solar power system can sometimes be a more economical choice than grid power. In addition to the cost of erecting power poles and stringing power lines to your location an ever increasing monthly power bill will find it's way to you if you connect to the grid. When sizing your residential solar power system you'll need to know how much unrestricted sunlight will fall on your selected area per day. Sunlight values will change from month to month as will the angle of the sun. Consider also how much power the household uses. Consult your energy bills for the past year to determine which month used the highest amount of electricity. Use the month of highest use to size your system. Do this after you've followed the tips above for reducing the size of your photovoltaic residential solar power system. Divide the monthly figure by the amount of days in the month to get your daily KWH's (Avg. daily use per household is 28KWH.) 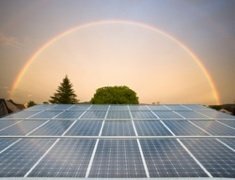 Once you know how many KWH's your system must produce daily, divide that number by 5 (or the number of peak sunlight hours you receive) Multiply that number by 1.45 to account for system losses and you have the size of the residential solar power system you need in order to keep up with your needs. Remember that your system will only work at it's peak performance for about 5 hours per day and only if it is oriented true south and canted to the ideal angle. The cost of an off grid home solar power system is substantial. A photovoltaic system would cost in the neighborhood of $30,000 (average) without any rebates factored in. And that's after you've cut your energy expense, implemented passive solar, switched to solar water heaters and pumps. Additionally, the batteries will need replacing every 5 years or so. No power bill for 40 years. Blackout Protection - If the power goes off in your neighborhood, chances are that you won't even notice it. Batteries must be sheltered, maintained and periodically, replaced. Solar Array (group of solar panels). Solar panels convert sunlight into 12 volt (DC) energy which is transported to and stored by the deep cycle batteries. In this form the energy will run any appliance or device that uses 12 volt power or that has a plug that fits into a vehicle cigarette lighter. 12 volt power does not run most household appliances or electronics. For the most part, households use 110 volt (AC) power and that's where the inverter comes in. An inverter converts the power from 12 volt to 110 volt for use in your home. The charge controller (regulator) prevents the batteries from over or under charging. Situated between the solar array and batteries, the regulator significantly extends the life of the battery bank. Solar off grid power is available at major home building stores and at many on line stores. Visitors to our Off Grid Solar Power page may also be interested in the following pages.